Jam packed full of Electronic Grooves, Arpeggiated Sequences, Manipulated Synths, Cinematic FX, Unique and Expressive Performance Patches, this beauty has a whole world of surprises waiting to be unleashed! Perfect for electronic music, film scores and experimental sound design. Normally $199 - now free! Yes you read that right - this is a totally free sample library! With over 300 instruments and 150 multis (Arps, pads, basses, keys, synths and sound FX), you’ll never find yourself short of sounds to use. Sick of Kontakt patches that aren’t easy to use or edit? 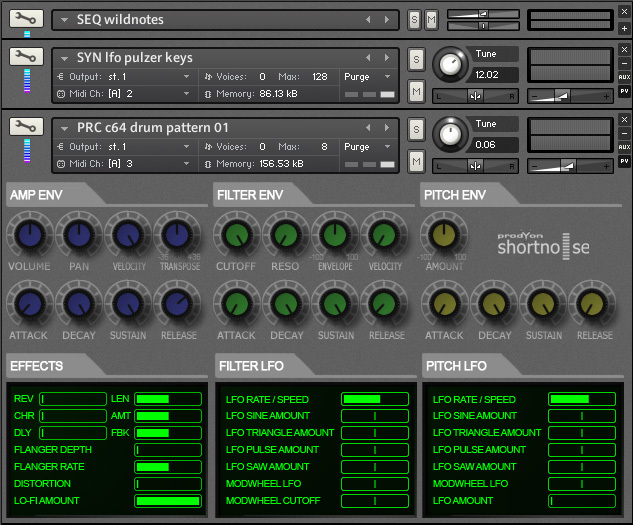 Shortnoise comes with its own custom scripted, beautiful looking GUI that allows access to most common parameters quick and easily. Create your own stunning new sounds by easily editing amp, filter and pitch envelopes on the fly, changing filter and pitch LFO’s and using the built in FX.